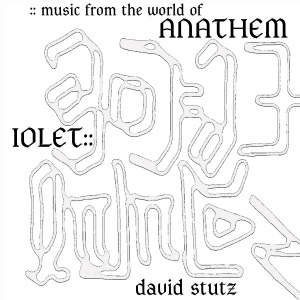 “IOLET::Music from the World of Anathem” is a CD that contains music to accompany Neal Stephenson’s book Anathem. Music is an important part of the cloistered world of the avout described in this book, and the pieces on the CD are meant to evoke the rich traditions of music that might exist there. A preliminary version of the disc shipped as an insert in the Advanced Reader Edition of Anathem, which was distributed to reviewers and other early readers; the final version, which contains additional music, will be released in September when the book is released to the general public. After hearing a short verbal description of the core ideas for Anathem during a dinnertime conversation with Neal in 2006, I was completely captivated by the world that he was creating. I began to draft musical ideas to match some of the musical traditions that he had described, and meanwhile, Neal supplied draft copies of his book to me as it took shape. The experimental vocal music that you hear on the CD and at this webpage is the result. 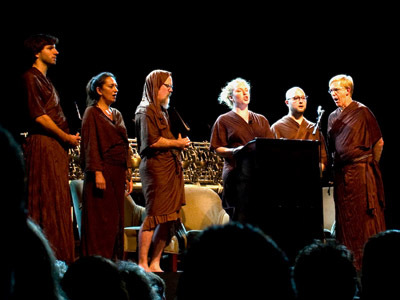 It was clear from day one that the characters and institutions found in the book possess many musical traditions, each forged over thousands of years of isolation, and each strangely similar to, yet exotically removed from, the monastic traditions of Earth. As an active performer of Earthly vocal music, as a lapsed musicologist, and especially as a composer, I was excited by the possibilities opened up by Neal’s imagination: somber music to celebrate the mysteries of philosophy and mathematics within the soaring stone walls of a mynster; simple songs to ease the mathematical drudgery encountered when verifying theories; inward meditations upon truth and beauty; and finally, fiendishly difficult musical games designed to hone intellectual prowess. All profits from the sale of the CD will be donated to the Long Now Foundation, an organization founded to highlight the importance of long-term thinking. Their “Clock of the Long Now” played an important role in Anathem’s genesis. The Burien/Interim Arts Space is an installation space by and for the current DIY/guerrilla generation. As far as I can tell, Kathy Justin and Dane Johnson, the project’s artist-instigators, sidled up to the city of Burien (directly next door to SeaTac airport) and said “hey, if you’re not using that empty city block, do you mind if we do?” They have successfully recruited sculptors to transform the wasteland into an urban sculpture park, with unapologetic emphasis on the grittiness of the site and the temporary nature of the installation, and have then hosted a series of live events in this open space. “Pieces of Eight,” a B/IAS event that will occur on 15 and 16 August, highlights their DIY spirit: a sound installation that features 8 independent speaker stacks, driven by 10,000 watts of amplification. These formidable resources are being made freely available to local composers and performers – 18 at last count. There will be pre-recorded octophonic pieces played during the day, and on Saturday night a smaller number of artists will perform live. Participating in this event was a foregone conclusion for me, since I love experimental public sound art and music. For the pre-recorded portion of the program, I have remixed Mascheroni Circles for eight channels, adding a low drone and some klang in the form of percussive metallic highlights to the voices of Linda, Melissa, and Rebekah. It sounds great in the studio – I can’t wait to hear it outdoors. For the live performance, I have selected samples from Perri Lynch’s Amazon field recordings, which I will combine using Ableton Live into an 8 channel ambient mix according to the rules of the Quaternion group. (See the illustration, which shows this group’s multiplication table, which I lifted from the very useful open source software tool called Group Explorer.) 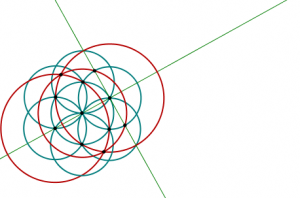 The quaternion group is useful in this context since it has an order of 8, and its combination of non-abelian complexity and abelian subgroups make for interesting kaleidoscopic combinations of elements. 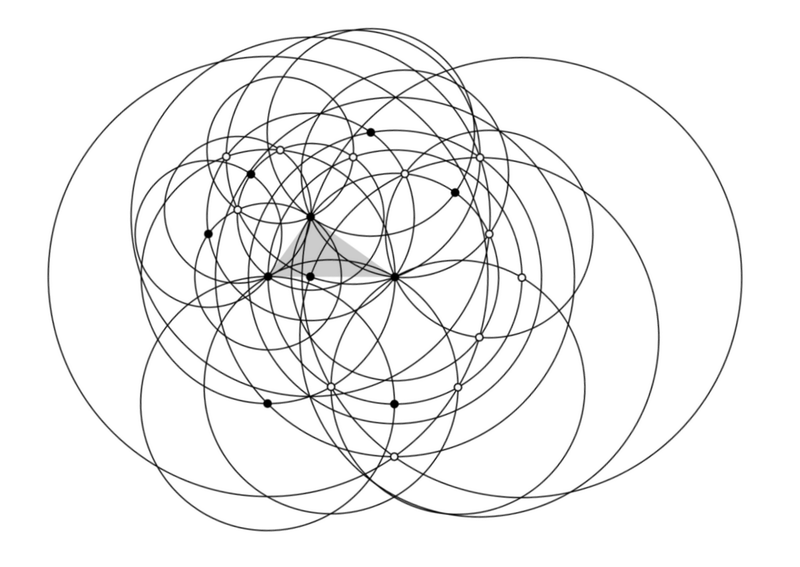 The group action of these quaternions is to trigger samples; I begin by iterating through Cayley and cycle graphs for the group, and follow with algebraic manipulations that seem appropriate for the setting. Although this sounds as though it might be dry and lifeless, no one will know that there is abstract algebra involved! The aural experience is a slowly shifting juxtaposition of the intense sound of the Amazon rain forest set against the desolate urban performance setting of concrete, asphalt, and rusting metal. As a side-note: quaternions, used as tools for rotational calculations, and the geometry behind Mascheroni Circles are both featured in Neal Stephenson’s Anathem, which is up for the Hugo award this weekend in Montreal. Good luck, Neal! 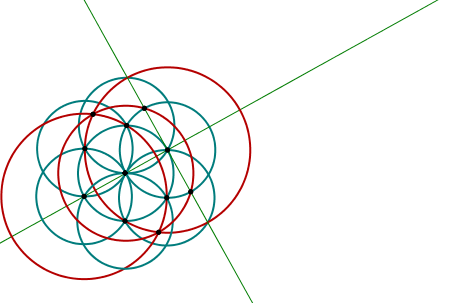 The picture to the right is a simple but beautiful Mascheroni construction which results in the points for the unit square. (You can see lines for 2 sides of this square in the drawing.) Melissa Plagemann and Linda Strandberg sang a live musical rendition of this construction at the Anathem launch in San Francisco. A week ago, back in Seattle, they helped me by making a quick recording of the duet for my archives. Several people have suggested that I post about cellular automata and music, since two of the pieces on the IOLET CD, Simple Automata and Sixteen-color Prime-generating Automaton, use one-dimensional cellular automata to provide their underlying structure. The subject has also been in the news with recent blog posts about using two dimensional automata for generative music-making. So consider this post to be partly liner notes for the Simple Automata (which can be streamed in its entirety here), and part speculative ramble by a composer who is also a computer guy. 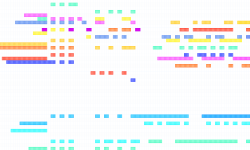 How and why would a composer use cellular automata for generative music-making? I’m not going to give a tutorial on CAs; there is a vast amount of information freely available on the web, up to and including Stephen Wolfram’s immense tome, in its informative, yet pompous, entirety. CAs are easy to understand, to notate, and to implement. Diversity and complexity can be generated by very simple machines, without the need for the complicated syntax and evaluation rules used by other common modeling approaches such as L-systems or Chomsky grammars. Perhaps as important as their ability to generate complex patterns from simple beginnings is their ability to generate interesting, yet repetitive, patterns, since the simple breaking of symmetry is far more fundamental to our human enjoyment of music than complexity. Automata are firmly established as tools for creating visual art and music. Musical applications of CAs appeared as early as 1988, and the popularity of Conway’s Game of Life rapidly made them truly commonplace. For this reason, when I decided to use CAs as a basis for the Anathem pieces, I wanted to appeal to listeners’ existing knowledge when present, and yet tread new aural ground. In Anathem, the avout sometimes use musical CAs to perform calculations on-the-fly as a group, and so the obvious place to begin my search was to consider how a group of people might perform continuously evolving CAs from rule notation, rather than from though-composed musical scores. Making music is especially enjoyable for amateurs when done in a group, and this experiment confirmed for me that performing cellular automata is a fun, unthreatening, group activity. As detailed above, each cell was represented by individuals clapping, but if those individuals were told to choose a note and sing it, rather than to clap, what would result is Simple Automata. In this piece, the “master of the automata” calls out a rule number (in Orth, on the recording), and the “cells” each pick a pitch before computing their way through a chordal landscape. The resulting chord is fixed until the next automaton is called, but the voicing of the chord changes as singers enter and exit. It is both an extremely simple approach and an interesting thing to which to listen. If the mental gymastics prove too hard, or if you want more control over tonality, the master can pre-assign notes; this is what we did to make the recording. Both approaches are fun to perform. The most notable feature of cellular automata is their synchrony: like all parallel computing activities, the cells of an automaton must share some notion of synchronization (which is, in this case, the pulse). For musical activity, unlike computing, synchronization is an advantage rather than an impediment. Performing together is the whole point, after all! Musical performance, like any process unfolding over time, can be thought of as computation. 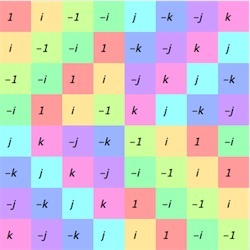 What is interesting about using CAs in this way is that the computation can be purely abstract. The process doesn’t need to produce any results besides the execution of the rule itself, which helps to explain why many researchers working with automata think of them as a way to model life itself. The mysterious cogs of the distribution system have whirred and turned, and the CD for the Anathem music project is now available from CD Baby [http://cdbaby.com/cd/davidstutz] and from the Long Now Foundation. The Internet tubes are also being filled as I post this, and so the album should also be available in digital form through other online retailers soon. Get ’em while they’re hot! Remember, all profits from this project go to the Long Now Foundation.